“Voluntary” now means you get forcibly bumped and dragged off a plane in a bloody mess. Chicago, IL – Our on-the-spot field agent reporter in Chicago is Zurdly Zervative who just happened to file this timely interview with the CEO of United Airlines after they forcibly removed a fully paid passenger from his seat for not voluntarily giving up his seat to Louisville because the flight was overbooked. 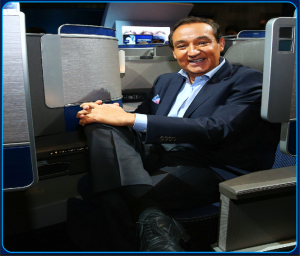 FM Observer: Is overbooking a problem for United Airlines and if so what can be done about it? CEO Oscar Muñoz: Yes it is. We are asking for less people to fly United Airlines so that overbooking is not such a problem for us which then might lead to less instances where we have to forcibly bump and drag paid customers off a plane in bloody daylight. FM Observer: So is “Bump & Drag” your new policy and slogan? CEO Oscar Muñoz: Yes. Bump & Drag is our new official slogan and policy. It has long been our unofficial slogan and policy but now we are simply making it official, if you will. FM Observer: Is it truly random how you pick which passenger(s) must voluntarily be forcibly removed while getting bloodied up in front of a planeful of gawking onlookers? CEO Oscar Muñoz: We say it is random but actually we just pick which person(s) we don’t like the most based on a number of “parameters” which our attorneys remind me that I should not mention here. FM Observer: Do you see this latest incident possibully hurting United Airlines and even you personally? CEO Oscar Muñoz: No. I think some people with twisted minds who may perhaps enjoy being forcibly bumped and dragged off an overbooked plane might actually increase our business once the word gets around that we do not-so-randomly bump and drag paid customers off a plane while bloodying them up in the process. FM Observer: Theoretically, looking back on what happened and how it was handled later, would you do now what you did then if you knew then what you know now? CEO Oscar Muñoz: Everything I did then I would do again if I knew then what I know now except I might change what happened initially and also my stupid insensitive comments about it afterwards, theoretically. FM Observer: Any reason why the United Airlines headquarters is located on Wacker Drive? CEO Oscar Muñoz: Thanks, but you do not want to know the answer to that question. And I’m sorry but it looks like we have another bloody incident here that I must try to cover up.